Right as you enter De Anza Smiles’ website, you are greeted with an exceptional, interactive layout that matches their slogan of “exceptional service, exceptional dentistry”. Dr. Saboowala, who is clearly passionate about dentistry, gave us the pleasure of designing her webpage. We gladly agreed. Our stylish web design is not only professional in paying homage to a doctor but also manages to incorporate modern design and integration all over the design elements. 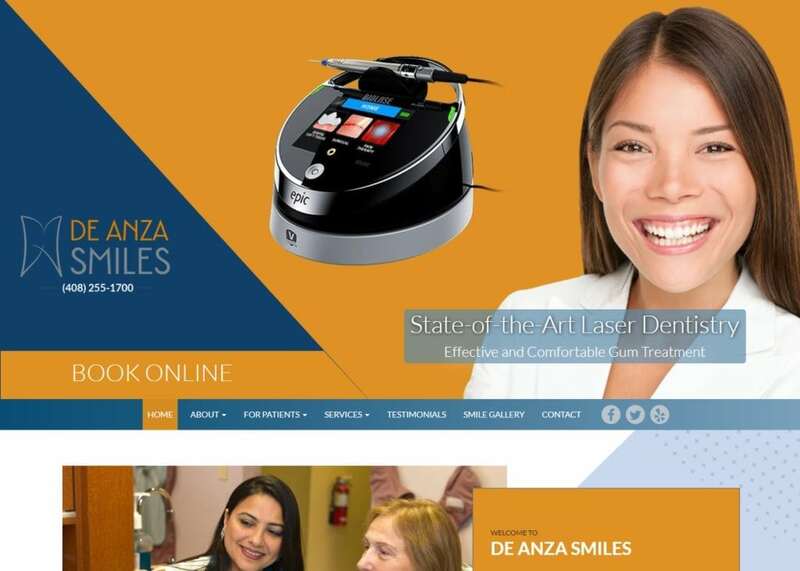 From the concise navigation toolbar to the easily accessible social media widgets, De Anza Smiles meshes personality with professionalism to create a stunning website that proves that dentistry can be much more than just drills and bills. The overarching design of the page is modern and interactive. Throughout the website, you will find patient education videos and special effects to enhance user engagement. We wanted to incorporate just how much knowledge Dr. Saboowala knew, on full display on the home page. When you scroll down the home page, you will find an interactive featured services page, a biography, testimonials, and even a map to display directions to her office. General dentists can be a difficult subject to tackle – even more so for those dealing with dental anxiety. We integrated an orange and dark blue color scheme throughout the site to ensure that any visitor feels welcomed and relaxed when looking for dental information. The pictures featured on the website using our square-shaped outlines can help calm anyone’s nerves as well. As we all know, a picture can tell a story just as well as words can. We went out of our way to find the best child-friendly photos to display on her website to welcome a younger audience as well. An additional bonus that De Anza Smiles holds is the smile gallery. Here, Dr. Saboowala displays before-and-after pictures that can attract skeptical users. Her blog is also conveniently located along our navigation menu for those wishing to dig deeper into her studies. Throughout the interactive website are services that she offers. Invisalign and dental implants are just some of the key features she offers. State-of-the-art dental technology deserves a state-of-the-art website to accompany it. There is no point having all the best dental gadgets if your website does not properly represent that, right? When you combine modern technology, sleek navigation, and soft color palette that De Anza Smiles has to offer, you get an awesome, professional website. Dr. Saboowala’s personality and talent work well alongside our integrative design to accommodate her patients accordingly.